Among the most popular bullion products on the market right now are stacker bars. These products feature new takes on bar design that make it easier for investors making bulk purchase of silver and gold to stack and store their investments. Right now, the 100 oz Silver Patriot Metals Stacker Bar is available for purchase on Silver.com. One of three available weights in the Patriot Metals Stacker lineup! Patriot Metals emblem engraved on the obverse. Scottsdale Mint seal on the reverse, along with swirl pattern design. 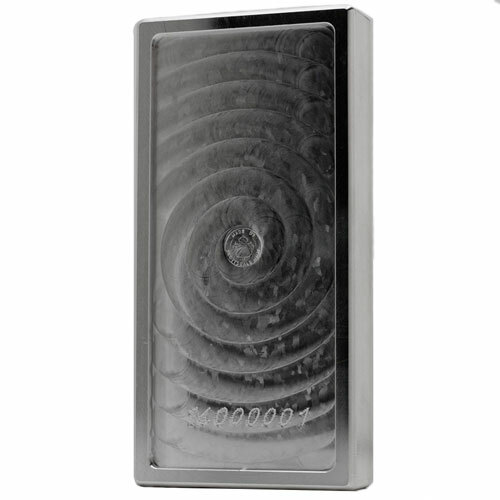 Each 100 oz Silver Patriot Metals Stacker Bar features a unique design that makes it easier, and safer, to store investment-grade silver bullion bars. These bars have sharp edges and contrasting raised and sunken fields. The obverse side of every bar has a raised design field. This fits perfectly inside the sunken design field of the reverse on all other 100 oz Silver Patriot Metals Stacker Bars so you can not only stack, but securely stack, your silver bars. On the obverse of the 100 oz Silver Patriot Metals Stacker Bar is the emblem of Patriot Metals. This unique take on the star and eagle features a star design, with a stylized eagle in the center whose spread wings form the horizontal line and two points of the star. There are three sets of four star groupings outside the primary star design, for a total of 13 stars representative of America’s original colonies. Patriot Metals is not a mint itself, but rather a brand lineup offered by the Scottsdale Mint. It was spunoff to Scottsdale Mint from Materion in 2012, and the bars are only available via authorized dealers such as Silver.com. Scottsdale Mint is a private facility located in the city of Scottsdale, Arizona. In addition to striking Patriot Metals branded bars, it also produces a variety of its own products and even commemorative sovereign coins for African nations. If you have any questions, please feel free to contact Silver.com at 888-989-7223, chat with us live online, or reach out to us via email.